Add a pop of color to your classroom with the Pink continuous roll scalloped border. Frame bulletin boards, artwork, doors, windows, shelves, and more with our vibrant continuous roll scalloped borders. Layer them together for a whole new look. 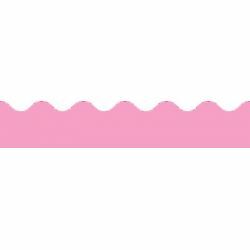 Continuous roll scalloped borders can be cut to your desired length. Includes 1 roll of border, 36' length x 2-1/4” width.